Edinburgh, Scotland’s capital, is an amazing city that comes alive at night. 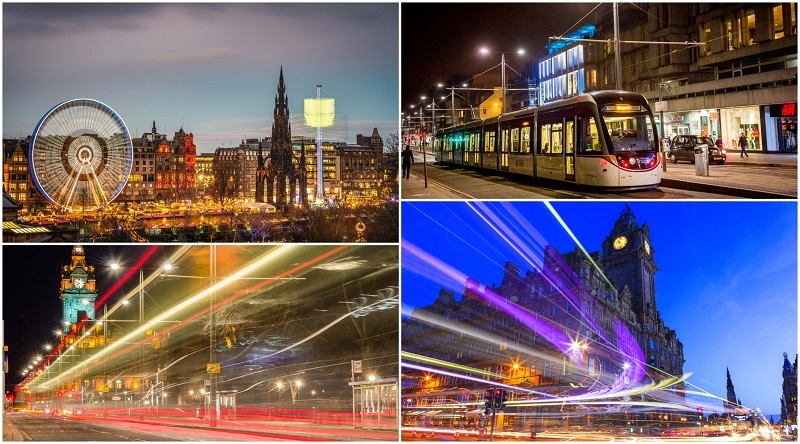 The city really bustles at night when tourists and locals alike come out to explore Edinburgh, be it on a tour of the underground vaults or a wander along the Royal Mile. Enjoy plenty of evening entertainment, from quaint pubs to traditional dining, comedy acts and whisky tastings. If you’re looking to explore Edinburgh activities or attractions, consider what’s on offer at night first before planning the trip. Here are 18 of the best things to do in Edinburgh at night. Edinburgh castle sits at the top of the Royal Mile, Edinburgh’s Old Town, and looms dramatically over the city. The great hall is lined with suits of armor and will no doubt dazzle visitors. The historic fortress dates from the 12th Century and was used as the royal residence for Scottish Monarchs until 1633, after which it was mostly used as a barracks. Edinburgh Castle also houses several exhibitions such as the national war museum and regimental museums. See Mons Meg, one of the greatest cannons in medieval Europe. 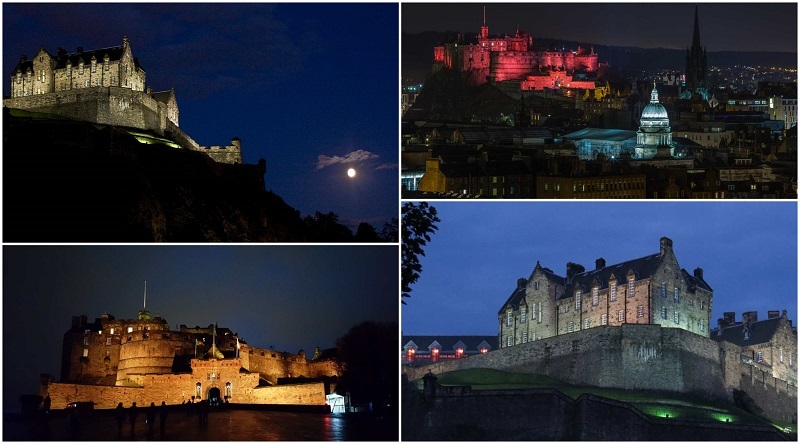 There are also a number of viewing points around Edinburgh where you can snap a photo of the castle shining brightly at night. Edinburgh is steeped in history, tales of terror and strange nightly activities. Visit Old Calton Burial Ground, a chilling cemetery after hearing gory tales about Edinburgh’s less than savory past. Body Snatchers who became murders, areas where monsters and mayhem ruled, and learn tales of cannibals. If there’s one thing the Scots are great at, it’s telling stories through the long winter evenings, and where better to discover these than a historic walking tour of Edinburgh at night. No visit to Edinburgh is complete without exploring the Underground vaults. The vaults are a series of chambers under the 19 Arches of South Bridge, completed in 1788. With limited space in the city it’s no surprise that the chambers were used by the criminal underworld as taverns, illegal gambling dens, illegal whiskey distilleries and places to plot. It is even speculated that body snatchers, such as the famous serial killers Burke and Hare used the vaults to store bodies overnight, although there is no proof of this. Discover the history of the vaults as you follow your guide through them. Edinburgh expanded greatly in the 18th century, so many of the underground chambers were used as workshops for business upstairs before the criminals took over. Not for the faint-hearted, this tour encompasses the darker side of Edinburgh’s history in the haunted Blair Street Vaults. After tales of witchcraft, torture and restless spirits you’ll be glad for the wee dram of Whisky at Meggets Cellar. Follow your guides candlelight through the vaults on this spooky tour. Visit sites of documented hauntings and decide for yourself if these restless spirits still wander Edinburgh today. 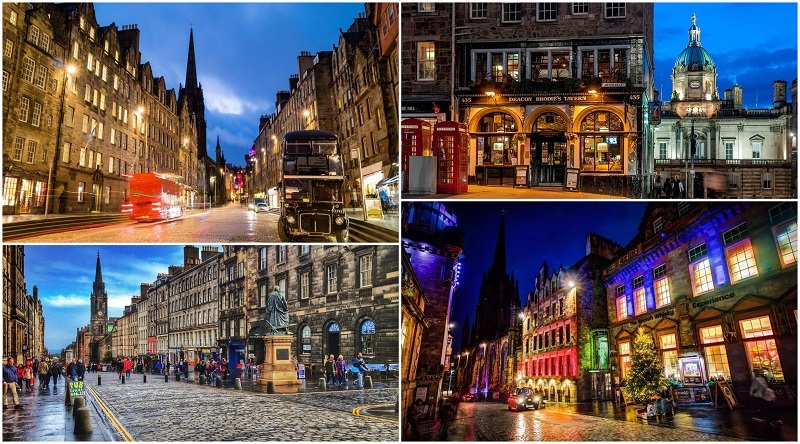 Edinburgh has plenty of haunted sites, and there is no better way to discover them than on a vintage bus ride of popular landmarks including the Royal Mile and the Grassmarket, which used to be the site of executions. Hear stories about murders, torture and hangings. 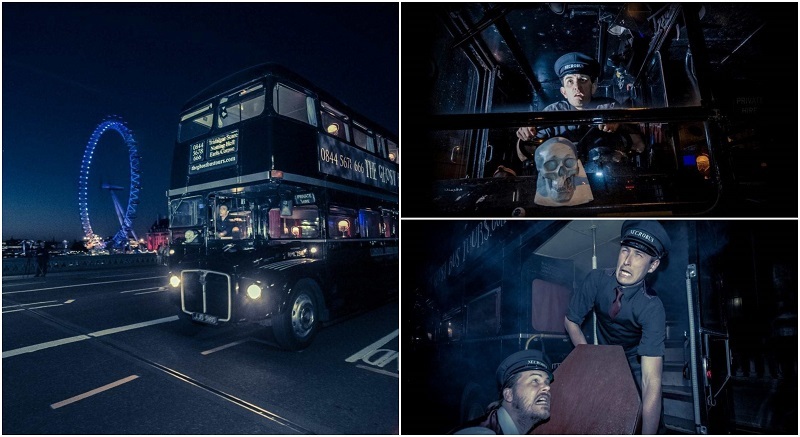 true life tales of body snatchers turned murderers, as the double decker bus winds through the narrow city streets. Mary Kings Close was one of the busiest, liveliest streets in 17th century Edinburgh, however it spent 400 years sealed up. Explore the streets with a costumed guide and learn about the lives of Edinburgh’s rich and poor. Find out how they lived and died, and how this area closed due to disease, fear and destruction it brought. Amongst the ‘local’s’ you will meet are the poet Robert Tennyson, a house maid and a plague doctor with their distinctive masks. 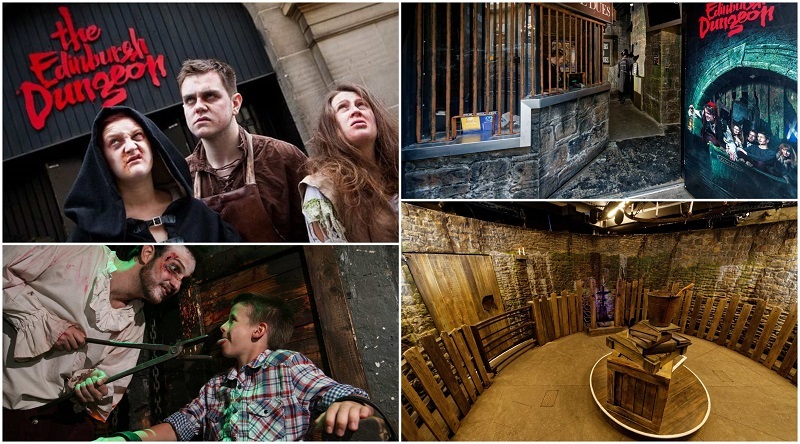 Along with the London Dungeon, Edinburgh Dungeon is a scary live actor and ride attraction which brings the most gruesome, grisly and ghastly tales and truths from Edinburgh’s past to life. Go on a witch hunt and discover just how far your family will go to prove they’re not witches too. Be found by Sawney Bean; will you escape or become the cannibals next victim? Be subjected to Braveheart’s revenge, and learn the etiquette of being executed; after all, it’s important to put on a good show and face the free fall of death by hanging. Edinburgh Dungeon normally closes at 4pm weekdays, but do extend their hours to 5pm or 6pm on weekends. J K Rowling wrote Harry Potter in Edinburgh, therefore it’s no surprise that she took inspiration from her surroundings. The complete Harry Potter experience includes both seeing the cafes she frequented to write and areas where she used her imagination, such as creating Diagon Alley from the historical narrow alleys with towering houses 8 stories tall. Lord Voldemort’s Burial place and the building which was her original Hogwarts School are also highlights. Night tours start at 4:30pm. After learning about Edinburgh’s bloody history enjoy a light hearted evening at the Monkey Barrel. Regular comedy shows showcase Edinburgh’s best comedians many whom do stand up during Edinburgh Fringe festival. Iain Campbell hosts Tuesday nights weird and wacky alternative comedy acts. Wednesday Nights see the Top Banana competition, hosted by Liam Withnail. Watch the comedians of tomorrow battle it out on stage to garner the most laughs. Sunday is perhaps the most prestigious night. Rick Molland hosts the up and coming comedians from all over Britain, giving the audience a brilliant chance to see the next big thing just before they make it. Whisky is the national beverage of Scotland and no wonder, it will leave you feeling warm on the coldest of nights. It would almost be wrong to visit Edinburgh and not have a ‘wee dram of Scotch’. Brewed from malted barley, Whisky must be aged in barrels for at least 3 years. Most of these will be used in blends, which use whisky from multiple brewings to produce a certain flavor. A single malt is exactly that, whisky from the same barrel and are usually aged for 8 or more years. Whisky is like wine, different regions produce different flavors, and therefore it can take a few tries to find your favorites. A whisky tasting experience at night is definitely the best place to start your journey of discovery. Visit the Waverley Pub, owned by the same family for over 8 decades, it’s the place to go for Whisky drinking expertise. Sample 4 single malts and wash them down with folklore and local tales, in the way the Scots have spend their evenings for centuries. There is no better way to explore a city than with a local. Your whisky loving host will undoubtedly know the best places to go, and the most interesting whiskies to try. Step off the tourist trail for some hidden pubs and drink like a local. Edinburgh is just as busy by night as by day, but you won’t see the crowds as they’ll be slinking down alleys to the best pubs Edinburgh has to offer. There are plenty of great pubs and restaurants all over Edinburgh, especially in the old town, but many of these are aimed at tourists due to their location. 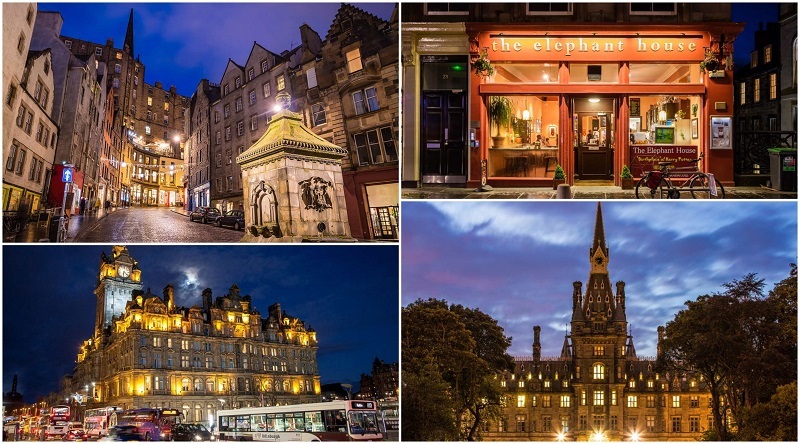 By joining a pub crawl you not only get to discover several of the top bars in Edinburgh and one of the best clubs, but you will get to meet other travelers and exchange stories as you drink into the night. If Gin is more your thing then head to Pickering Gin Distillery. Pickering’s have exclusively produced Gin here for over 150 years, therefore they are the unrivaled place to learn all about Gin. Find out how craft Scottish Gin is made from an old Indian family recipe from 1947! Gin is certainly about a lot more than a Gordons and Tonic as you will discover during the tour of the distillery and tastes of 3 Pickering Gins. Its a refreshing way to start your evening. Tour starts early evening at 4 pm. It is almost impossible to visit Edinburgh without visiting the Royal Mile, an uphill cobbled road lined with all manner of pubs, cafes, restaurants, shops, and tours. The old stone buildings stand tall and proud, narrow alleys and squeezed in between the old buildings and many have hidden delights. Pass Greyfriars Kirk, and continue up the interesting street culminating in Edinburgh Castle. There is a wealth of history on the streets, and there is no better way to discover it than on foot. Do you dare to try haggis? Some say it’s a small guinea -pig like creature with one side of legs longer than the other to help it run around hills. Haggis, however, is traditional a sheep’s bladder filled with minced liver, heart and lungs, flavored with onion, herbs, oatmeal and suet. Served with neep’s and tatties (Swede/ yellow turnip and potatoes) it is now somewhat of a Scottish delicacy and well worth trying. It is actually very tasty and has a delicious savory flavor. Bannocks (Oatcakes), Shortbread, Colcannon (a stew of cabbage, carrots, turnip and potatoes) are all other traditional Scottish dishes. Enjoy a feast accompanied by Traditional bagpipe music and more Scottish tales, myths and legends. Contini Canonball Restaurant and Bar hosts a fantastic 3 course dinner, serving traditional Scottish food. The Storyteller’s tales are rich in Scottish culture and prose about Scottish Icons, including the Patron St. Andrew, the Kilt and the Purple Thistle. Listen to bawdy songs and highland music, watch traditional Scottish dancers, and enjoy a 4 course meal which includes a taste of Haggis. A local foodie host will introduce you to one of Edinburgh’s best places to eat. There you can enjoy a dining experience tailored to suit. Perhaps you will visit a humble pub with home cooked food and beer, or a fine dining restaurant. One of the main thoroughfares of Edinburgh and the shopping central of Scotland’s capital, Princess Street comes alive at night. The adjacent Princess Street Gardens provides a beautiful park, great for a quiet evening stroll. The National Gallery of Scotland and the Royal Scottish Academy sit within the gardens. Pause for a moment and absorb the Gothic splendor of the Scott Monument, a tribute to the Scottish author Sir Walter Scott who wrote the Waverley novels. Enjoy the sights and sounds of buskers performances, and choose how much of your evening you wish to spend peacefully in the gardens or amongst the cities hustle and bustle, especially on Thursdays when there is late night shopping. The Camera Obscura and World of Illusions is an eccentric and strange place to visit. A place where illusion thrives and your brain will struggle to figure out what it sees. There are over 150 hands on exhibits to experience here. Can you find your way through the maze of mirrors? How will you find the swirling vortex of lights? Nothing here is as it seems. Perhaps the best, and certainly on of the most intriguing exhibits is the climax; the Camera Obscura show itself. Using Victorian technology watch people walk the streets outside. There are no projectors as this technology was developed long before film existed. Camera Obscura normally closes at 7pm monday to Thursday, but open til 8pm Friday and Sunday, and 9pm on Saturday. Satisfy the Star-gazer inside and pre-book a trip to Edinburgh’s Royal Observatory, or attend one of their events throughout the year. Opened in 1894, the Royal Observatory is still a busy place today with its cutting edge science and technology nestled into a beautiful historic building. Attend an astronomy talk on Monday nights during winter, and learn about the night skies above us, or book am Astronomy event on selected Friday evenings. The Royal Edinburgh military Tattoo takes place in August, and is certainly unmissable if you visit then. 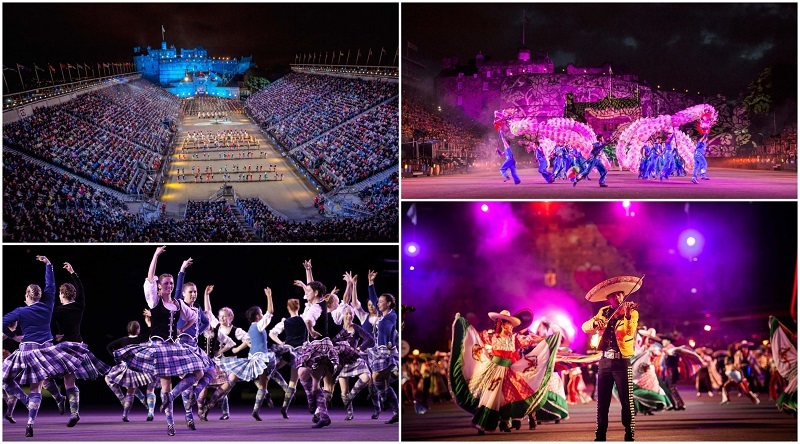 Edinburgh castle’s floodlit Esplanade is the perfect location for a whole host of performances from around the globe. See Scottish dancers dressed in all their tartan glory, listen to Scottish pipe and drum bands, and so much more. The festival was inspired over 70 years ago, by a show called ‘Something about a Soldier’ performed in 1949 at the Ross Bandstand in Princes street gardens. The first ever Military Tattoo was organised by Lieutenant Colonel George Malcom who aimed to bring to life the Army’s contribution to the Edinburgh International Festival. I wonder what he would think of it today. Christmas is a huge festival in Edinburgh, especially at night. The first things everyone thinks of about Christmas is snow, Christmas trees and of course lights. 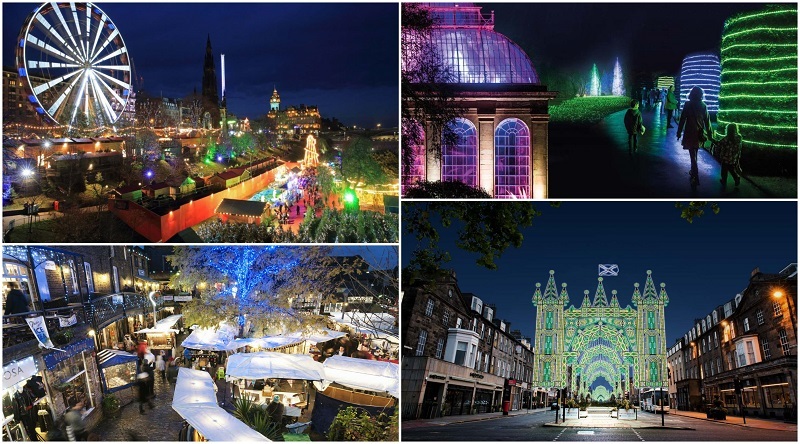 It’s unsurprising, therefore, that Edinburgh is one of the best destinations to visit during Christmas. Wrap up warm and brave the cold, because the Christmas lights and jolly atmosphere is one to experience. Christmas isn’t complete without a visit to the Christmas market, a drink of warm and spicy mulled wine accompanied by a mince pie, and an evening stroll taking in all the glorious Christmas lights. Edinburgh has so much to offer, it would be mad to miss it given the activities at night. If you thrive on hustle and bustle then exploring the Royal Mile and Princess street are the perfect way to spend the evening, or better yet, time your visit for one of Edinburgh’s festivals. 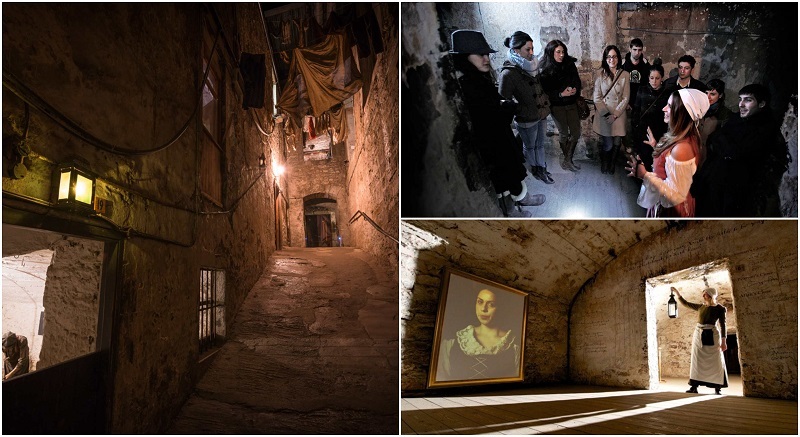 There is so much dark history both below and above Edinburgh’s streets, an underground vault tour is an essential activity to undertake, whether you want to learn about the Cities past or seek out scariness. 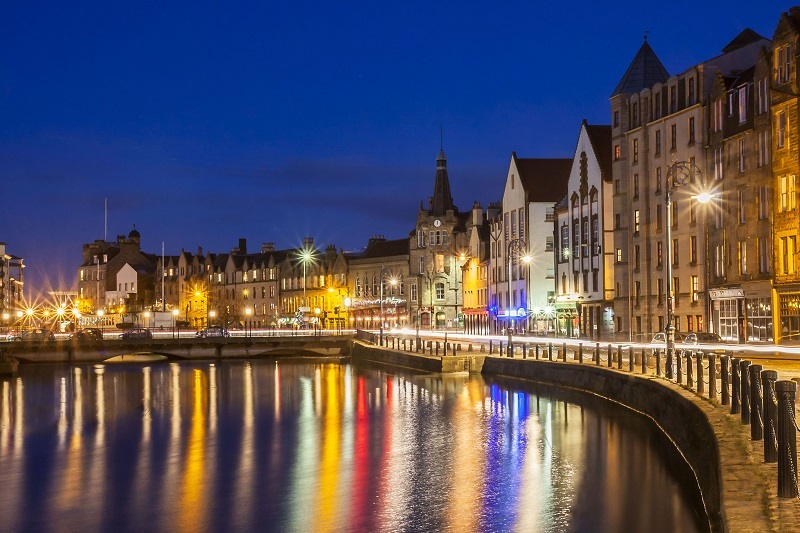 Edinburgh remains one of the most interesting, varied cities to visit at night in Europe, and the bonus is most of the top attractions are within walking distance of each other!